Forkliftcenter and Konecranes partner on large Grimaldi Group order. Custom-made heavy-duty forklifts are at the centre of a three-partner deal recently concluded between Forkliftcenter, the Italian shipping group Grimaldi and Konecranes.The deal foresees the supply by Konecranes of six units 12 tonnes capacity and twelve units 42 tonnes capacity heavy-duty forklifts and another eighteen smaller machines and equipment of other brands to the Grimaldi Group for operations on its ocean-going vessels. Konecranes will custom-manufacture these high capacity forklifts which will have a lower than average height for easy access, and will also have a specially designed container spreader attachment for better maneuverability in tight spaces onboard the vessels.The deal includes a world-wide service contract that will be fulfilled via Forkliftcenter and Konecranes’ global service network. Forkliftcenter has a unique approach: they are brand-independent. Each deal is tailor-made, so that clients like Grimaldi get their specific lifting equipment problems solved using an optimal mix of advice, machines and services.The forklifts will be used on the vessels Grande Lagos, Grande Tema, Grande Cotonou,Grande Abidjan, Grande Dakar and Grande Luanda, a series of six ro-ro multipurpose vessels ordered by the Grimaldi Group to the South Korean shipyards Hyundai Mipo. The first three vessels have already been delivered and are operated by the Grimaldi Group between Northern Europe and West Africa, while the remaining three units are due to be delivered by the end of the current year.With a gross tonnage of 31,600 tons and a length of 236 meters, these vessels have a loading capacity of 5,700 linear meters of rolling cargo and 1800 TEU. They are also designed to achieve significant fuel efficiency and operational flexibility, in line with Grimaldi Group’s program to focus on reducing the environmental footprint.Bjørn André de la Porte, CEO of Forkliftcenter, comments, “Without genuine partnership, team-work and flexibility, such as we have with Konecranes, we would not be able to resolve client challenges as successfully and often as we do.”“It is the first time that we deal with Konecranes and Forkliftcenter to supply new equipment”, commented Mr Gianluca Grimaldi, President of the Grimaldi Group. 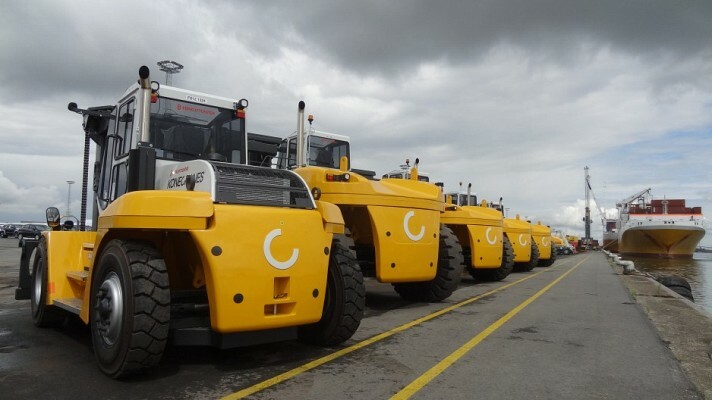 “The machines ordered will play an important role in the capacity and efficiency of the cargo handling operations of our new-generation vessels”.This willingness to adapt to clients’ needs is an essential part of the Konecranes approach, and has ensured they remain an A-status manufacturer with Forkliftcenter.